BLACKRAIN Reveal Animal Activism Music Video For "Run Tiger Run"
Joining them in the music video is famed French comedian Remi Gaillard, who rose to superstardom as a viral YouTube personality (nearly six million subscribers). Also an outspoken animal activist, Gaillard portrays a tiger being hunted in the woods, running for his life. He is eventually rescued by fellow guest star Gilles Lartigot. Take a look at the video on KNAC.COM right HERE. Bassist Matthieu De La Roche states, "The idea behind this video was to collaborate with Remi Gaillard and Gilles Lartigot as we've recently discovered we share the same concerns in animal welfare. It was great fun to create a video that sees the mutual collaboration of an internet sensation, a writer and musicians. Activists have much more to tell about the subject and possibly in a much better way we could ever do. We just wanted to express in our own way our feelings about the drama that appears every day in this world: 150,000,000,000 animals are killed just for food each year. Can you imagine that?" Formed during 2006 in the French Alps and with four self-produced albums under their belts (not to mention numerous gigs in France, Europe and Japan) BLACKRAIN know for a fact that 2016 is undoubtedly the most important year of their career to date. Free from past commitments, they now feel it's time to "escape" to new horizons. While remaining faithful to their roots and influences, BLACKRAIN are a band in a state of perpetual evolution: never ceasing in their quest to climb each and every step of the long Rock 'n' Roll stairway. 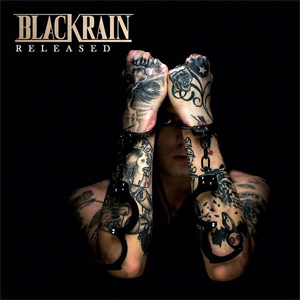 Their latest album Released is proof that the journey is well and truly under way, and the meticulous craft work behind Released reflects the stamina and capacity of BLACKRAIN to create something never really achieved by a rock act from France.